This story takes place towards the tail-end of World War II in rural New Mexico and focuses on a loving Hispanic family. We see the world through the eyes of Antonio Marez, a young boy living on his family’s farm who is looking for guidance in the world. 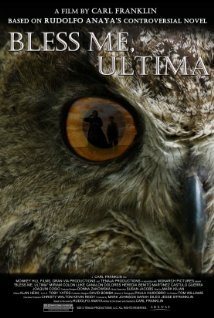 When a dear family friend and healer moves in by the name of Ultima, young Antonio is entranced by her and the two form a connection to which Ultima teaches Antonio how to respect and love nature and the Earth in order to lead a good life. Ultima herself knows she doesn’t have that much time in the world, so she does everything she can to teach Antonio her knowledge and other-worldly skills. You see, Ultima is viewed by others as a witch who delivers curses upon others. She is accused of cursing her enemies and healing the near-death back to health. The novel goes much deeper into this paranormal and witchcraft like aspect, however this film adaptation directed by Carl Franklin focuses more on the young Antonio going through his boyhood and discovering the light and dark sides of life. Antonio goes to a strict Catholic school where kids are punished more often that actually getting an education and befriends a kid who does not believe in God. He is picked on in school for being different, intelligent, and having a “witch” living with him. Meanwhile, Tenorio, one of the prominent men in the rural New Mexico town’s daughter passes away, to which he blames Ultima for cursing her. This leads him to go on a blind rage and recruit others with literal pitchforks and torches to go on a witch hunt. On the other hand, the young Antonio sees one of his older brothers who is finally home from the war constantly hanging out at the local brothel and is constantly tormented by Tenorio who wants to kill Ultima and the family she lives with, including Antonio. Now this might seem like an adult movie at times, buy Franklin used a young and light touch while telling this story and is more a coming-of-age film than a paranormal thriller about witchcraft. Franklin shows us the beautiful landscapes of rural New Mexico, where it was actually filmed throughout the movie, and we get a glimpse of just how beautiful the world is for Antonio, despite the horrific things that are going on around him. It was as if Franklin was conveying that nature and the Earth will always bring us peace. It was beautifully shot. The ensemble cast is decent as well with Benito Martinez being the most known out of the actors, who he plays Antonio’s father. Miriam Colon plays Ultima with grace and comes across like a kind and warm grandmother with a very haunting side. She can scare you, then in a flash make you fall in love with her. And Luke Ganalon plays the young Antonio who does a decent job playing the straight and narrow and I’m sure with time will come into his own. ‘Bless Me, Ultima‘ was an endearing film full of wonder, magic, and family. It had a wonderful message, a great cast, and despite the big possibility it not being a giant blockbuster at the box office, I have a feeling that families across the globe will gravitate towards this light-hearted film to show their kids. This entry was posted on Wednesday, February 13th, 2013 at 6:26 pm	and is filed under Film, News. You can follow any responses to this entry through the RSS 2.0 feed. You can skip to the end and leave a response. Pinging is currently not allowed. « The New Poster for ‘Iron Man 3’ is All About Don Cheadle!!! It's funny what a man will do to forestall his final judgment. You made a deal with him too, Jack. He raised the Pearl from the depths for you. Thirteen years you've been her captain. You won't be able to talk yourself out of this. The terms that apply to me apply to you as well. One soul, bound to crew a hundred years upon his ship. Then it's the locker for you! Jones' terrible leviathan will find you, and drag the Pearl back to the depths and you along with it. Any idea when Jones might release said terrible beastie? I've already told you, Jack. Your time is up. He comes now.